The Law Offices of Trent R. Buckallew, PC is a professional corporation engaged in the practice of law and is committed to the defense of individuals charged with a crime. If you are facing criminal charges, contact a Board Certified Criminal Defense Lawyer to discuss your legal options. The Firm has extensive experience in criminal litigation and represents individuals charged with any crime including first time DUI offenses or charges related to serious felony violent crimes. Mr. Buckallew has a reputation for zealously defending each and every one of his clients and is committed to providing you with an experienced and aggressive defense against any criminal charge in the State of Arizona. 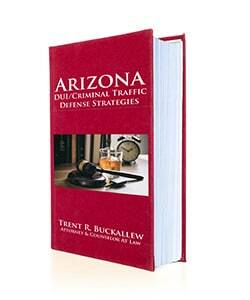 Mr. Buckallew has also been certified by the State Bar of Arizona as a Criminal Law Specialist. Mesa Board Certified Criminal Law Specialist Trent Buckallew, will provide the legal advice and assistance regarding your rights subsequent to an arrest and prior to making potentially incriminating statements to law enforcement. In addition to having his law degree, Attorney Buckallew also has his Master's in Forensic Science (M.F.S). This enables him to understand the science behind the evidence, allowing him to see potential weaknesses that may be present in your evidence! This unique and diverse training and background enables him to provide an aggressive defense for you! Have you or a loved one been accused of driving under the influence of alcohol? The Law Offices of Trent R. Buckallew, PC has the skill and nearly 20 years of experience in defending individuals against any drunk driving violation in the State of Arizona. Mr. Buckallew is a Board Certified DUI Specialist, meaning he has significant knowledge, competence, professionalism and integrity in the area of DUI Defense. Mr. Buckallew has handled DUI cases in just about every City, Justice and Superior Court in the Valley and has made court appearances in every county in the State of Arizona. Mr. Buckallew also belongs to many respected criminal defense and DUI-related organizations, including the National College for DUI Defense (NCDD) as well as the National Association of Criminal Defense Lawyers (NACDL) to keep well informed of the ever-changing and complex practice of criminal law. If you have been arrested or charged with a DUI violation, contact the Law Offices of Trent R. Buckallew, PC to discuss your legal options. A DUI violation can result in significant consequences, as Arizona has some of the harshest penalties for DUI convictions in the country. If convicted in Arizona, you could be facing significant jail time, community work service, heavy fines and court costs, a driver's license suspension, alcohol treatment, ignition interlock requirements, and other penalties. In Arizona, even a first time misdemeanor drunk driving offense carries mandatory jail time. For individuals with a prior drunk driving conviction, the penalties increase exponentially for each subsequent conviction, eventually leading to more serious felony charges and more significant consequences. At the Law Offices of Trent R. Buckallew, PC, you will find a Mesa DUI attorney who has the background, knowledge, and experience necessary to aggressively defend all types of drunk driving cases, including both alcohol- and drug-related cases. Accused of a Drunk Driving Offense? Mr. Buckallew is not only an experienced litigator with extensive trial experience, he also holds a Master's in Forensic Science (M.F.S.) degree which gives him unique insight and expertise in challenging the scientific evidence in your case. The firm has a proven track record in successfully resolving serious and complex criminal and drunk driving cases and will vigorously advocate on your behalf. Early involvement by the Firm is critical to ensure that your rights are protected throughout every stage of the case. A full investigation of the evidence against you will be undertaken as the first priority. Through the course of his investigation, your DUI attorney will identify any potential legal or factual weaknesses in the case and determine the best course of action in resolving your DUI case under the most favorable terms possible. If you are under the age of 21 and have been charged with an underage DUI, you will be facing similar penalties if you are convicted. As a young adult and underage driver, this type of offense on your record can greatly restrict your future opportunities. You may not be able to get into the college of your choice because a DUI can dramatically affect your eligibility for loans and scholarships. You may also be denied certain job opportunities in licensed professions. As a parent who wants the best for his/her child, contacting an experienced defense attorney is critical in ensuring the best possible outcome is pursued in your child's case. If your child is convicted, he/she could face up to 6 months in jail, loss of license for up to two years, significant fines and other penalties. An experienced attorney will help your child navigate through the often-complicated criminal justice system and fight for the best possible resolution in your child's case. The Law Offices of Trent R. Buckallew, PC can also represent individuals facing all types of drunk driving charges, and will ensure each and every client understands the possible range of DUI penalties, and available defenses against first time DUI, leaving the scene, cases involving underage DUI, super extreme DUI, DUI with injury, aggravated DUI, and those involving DUI & drugs. In many cases, DUIs are charged as a misdemeanor offense. Under certain circumstances though, you may face felony charges if you were driving under the influence with a minor in the car, driving with a suspended/revoked license, or you were involved in a car accident at the time. The firm has extensive experience in challenging evidence, including breath & blood tests as well as field sobriety tests and is very knowledgeable regarding the testing procedures and related science behind the various tests inherent in these cases. A thorough investigation of all discovery in your case including, police reports, blood/breath/urine tests, field sobriety tests, witness statements, photographs, audio/video recordings, etc. is critical in defending your case in court and negotiating a favorable outcome with the prosecuting agency. In many DUI cases there are factual, legal and procedural errors or constitutional violations which may be identified through the review of the arrest process, including the administration of tests, the analysis of blood/urine samples, police or arrest procedures, etc., and these can be challenged in court. An experienced defense lawyer will conduct a thorough investigation of each case, identify potential weaknesses and issues requiring litigation, and either negotiate a settlement in the case or facilitate a bench or jury trial, if this is deemed the best course of action in your case. Every case presents with a unique set of facts and you should consult with an experienced Mesa DUI attorney to determine how best to proceed in your case. It is important to hire an attorney who is specializes in DUI defense and someone who is knowledgeable and experienced in litigating the multitude of issues that may exist in any criminal case. You will find this high-quality legal representation at the Law Offices of Trent R. Buckallew, PC. The firm handles a wide array of issues associated with these types of cases, including addressing vehicle impoundment issues, vehicle interlock device issues, and representing individuals at MVD hearings in an attempt to avoid a suspended drivers license. It is imperative to fight against drunk driving charges because of the harsh penalties which can result from a conviction. One of the potential hardships associated with a conviction is the loss of driving privileges. This presents any number of challenges, from commuting to and from work to transporting children to and from school, after school activities and the like. Mr. Buckallew and the firm's legal team can represent individuals at MVD hearings to present arguments in favor of preventing a license suspension and alleviating the resulting hardships. Mr. Buckallew understands the impact of a drunk driving case and the hardships caused as a result of having a conviction on your record, and will work vigorously in building a strong defense on your behalf. The Firm is experienced in handling all types of DUI cases and has proven results ranging from acquittals at trial, full dismissals and negotiating non-DUI plea agreements. Having confidence in your attorney and in the legal representation that you will receive is a critical factor when looking for the right attorney to represent you. Contact the Law Offices of Trent R. Buckallew, PC today to discuss your legal options. The scope of this work is designed to inform the reader as to the basic overview of strategies and techniques that one might employ in preparing a case for a successful D.U.I. defense in an Arizona courtroom. It is a general overview and is not meant to be an exhaustive work covering every situation. Rather, it is designed as a starting point for clients to work with their attorney in developing a successful defense to a D.U.I. case. 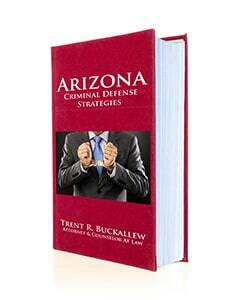 The scope of this work is designed to inform the reader as to the basic overview of strategies and techniques that one might employ in preparing a case for a successful criminal defense in an Arizona courtroom. It is a general overview and is not meant to be an exhaustive work covering every situation. Rather, it is designed as a starting point for clients to work with their attorney in developing a successful defense to a criminal case. Complete the contact form or call us at (480) 988-7993 to schedule your free consultation.